First of all I apologise, I have felt really guilty not updating my blog everyday this week! :( I have had a REALLY hectic week. Without anmore delay I introduce to you my purchases for the week! Shirt - Urban Outfitters Sale price £19.99 from £38.00. 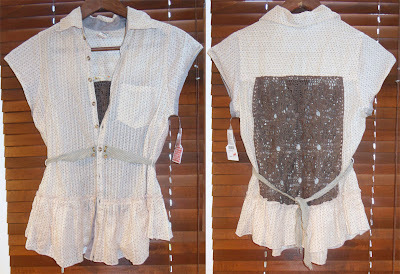 How gorgeous is the detailing on the back? I love this :) FYI: I took the last one in Oxford St, London. Dress - Mango £32. 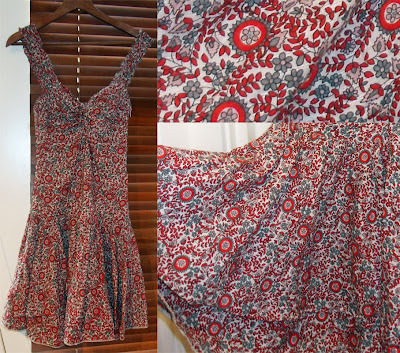 I love this cotton print dress, The price is SOOO cheap compared to the fact that it's such a gorgeous versatile dress! It has a nice snug fit and flares out at the bottom, slightly Spanish style. You can wear it dressed up with gladiator heels, dressed down with tights and slouch boots, or just plain and summery with flip flops! 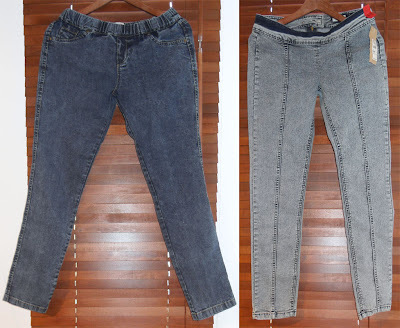 Jeans - River Island (left) £24.99 (right) £34.99. The left pair has an elasticated waist, in the style of leggings (they are reall denim fabric not jersey ones) It feels SO comfortable and I want to buy 1 in every colour! The pair on the right is a lovely skinny jean with seam detailing, I love stone washed jeans, this one has a zip at the back which is really cute! Moving along.... I usually use L'occitane ultra comforting cream cleanser to remove my face makeup on a cotton round, and then wash my face with NY orange flower water facial wash. Both products are amazing however were not accessable yesterday. I opted to try this by Kiehls. It's a non foaming washable cream cleanser that you can use to remove light face make up on a cotton round and essentially also wash your face with it. It's very gentle and suitable for dry and sensitive skin! I used it last night and this morning - I LOVE IT! also kills 2 birds with 1 stone! I will do a few review on it after a couple of weeks. Here is a close up og the brush for lash stiletto, it looks really impressive - described as a stretch and set brush by Maybelline. I have high hopes for this! That dress is gorgeous, I need that in my life!!! Looooooooove the clothes that you bought! So prett and will suit you a lot! That Mango dress is stunning, i think you will look so pretty in it!! I so want to get myself one too. River island jeans seem comfortable, too bad we don't have river island here. I've been meaning to try Neil's skincare too, but it's not accessible here. Love all your new things! I'm sorry to be so nosey but how much does the Jasmine enriching cream and orange flower water cost? Can they only be bought at Neal Yard shops or do other shops stock them? Also which do you prefer the L'occitane cleanser or your new Khiel one? I don't ask much do I?! heehee! I'm a beautyaholic and just love finding out about new products, I'm super glad you updated your blog again. love the clothes you got, and i have that kiehls cream and love it too! Great haul! I love the dress! In general am a big fan of RI jeans. Im 5ft10 1/2 and they have jeans that fit me!!! Im so grateful to you for turning me on to Neals Yard. My skin really loves the stuff! @Melek you can buy them from the Neals yard shop and now bigger boots have started selling them. So far I definately prefer the khiels one, its much creamier and makes my skin feel sooo clean, but i have to waiut to see if i get allergic to it - full review soon!